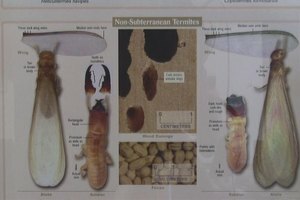 Getting rid of maggots means cleaning up garbage areas or wet areas, and eliminating the adult fly to prevent the second generation of maggots. 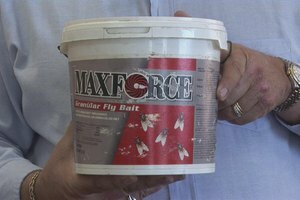 Learn about granular fly bait that can be used to get rid of maggots with help from a certified pest control operator in this free video on pest control. Hi friends, I'm Mark Govan with ABC Pest Control in Largo Florida. And one of the main things you can do to get rid of the actual maggot stage is to go ahead and clean up any of the garbage areas or wet areas that the actual flies are laying their eggs on the top of. And that's real important because if you can eliminate the actual adult fly you won't have the second generation of little maggots coming up and around your food; food or anything in the garbage that you might have. Now we've got a couple materials that you can use to go ahead and get rid of it and I've got one right here. This is put out by MaxForce. And this is called MaxForce granular fly bait. And this product is very very effective. You can spread this out either on the ground using the little hand held spreader and what this will do is it has a fly attractant in it and the flies will land on it and take a little bite of the, of the bait, and it takes them about thirty seconds or so and the adult fly will die. So then you won't have another generation of flies after that. There's another product that MaxForce also puts out which is a fly aerosol and you can spray that on the glass, and it has a pheromone which actually attracts the fly to the glass, they take a; they get on there and that pheromone will actually kill; attracts them to it and then the bait in there will actually kill the fly as well. Both of these are going to help you get rid of the maggots that you may be seeing in and around your home. I'm Mark Govan with ABC Pest Control in Largo Florida, hoping you have a pest free day.